The Library right now needs more functions in my opinion. Once you have alot of tiles, it can get kinda hard to navigate through it. Linking multiple projects doesnt help much, since all tiles from all projects are listed in The Library. Folder system: You can create folder in The Library. You can place tiles inside the Library. If you click on a folder, only the tiles in that folder are shown, while all the others are not shown. There is also a button that lets you show ALL tiles from all folders at the same time. Folder are always on the top of The Library. Sort function: You can name tiles/tilesets and give the categories (like ground_tiles, walls etc.). You then are able to sort them by name, or search for a specific category you have. Only show tiles from one project: If you have linked multiple projects together, you then are allowed to only show tiles from a specific project, instead of all at once. This would certainly help me to organize my tiles and use them more efficiently. although your wish is not solved there, but did you check out the beta? The tile mapping system has been reworked a lot. There will also be a tutorial video once the version is released that explains how to use the tile library and where to better use a tile set sheet and how to do this. How many tiles do you have in a normal project and what is a typical tile size? Or is it just that you want to better manage your tiles and finally all of them should be in a single tile set, e.g. when exporting to some game engine? About your last question: I want to better manage my tiles and all of them should be ideally in a single tile set (but in different folders, so that I dount have to browse through 10000+ tiles in the end). so you overlay these using layers? Would it make sense to do the following:? 1: your overall tile set where all tiles are placed in an arranged way (your image from the prev, post) so that you can use this image as a tile set in any game engine as it is. So you can easily go to that project and the corresponding frame to find your assorted tiles there. Does it feel complicated? Please let’s dig deeper into this. It would be a workaround, But I think it would be better to have folder for my tile library and also folders for my Brush Container. Especially a folder system for the brush container would allow me to organize objects that consist of multiple tiles and have an easy time to find what I need. 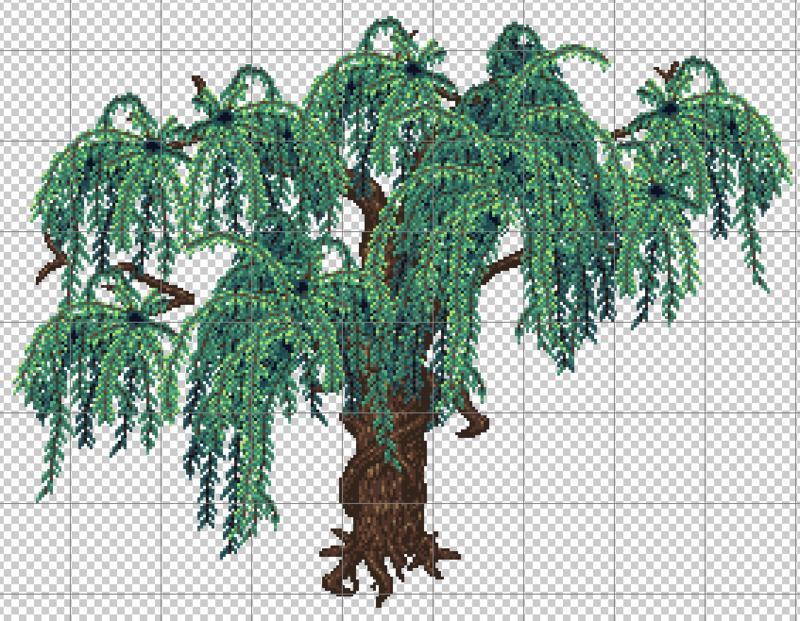 It would be much easier to create a tree like above without searching your objects in the brushcontainer or browse through different frames. Okay, understood. I have something in mind that would do the job, but I can’t add it with the upcoming release. Will add it to my list if change request for now. Thanks alot! Especially combined with my other suggestion “creative tab”, it would help alot to create more complex / modular PixelArt.